Geek is totally chic when it comes to this awesome boy’s science themed birthday party by Princess and the Frog. 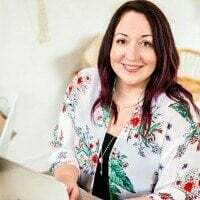 Anna developed ideas for this party to celebrate the fifth birthday of her son, Harris. Every decoration detail is so boy appropriate. From official looking lab attire to an amazing flask cake to a dessert table full of science themed eats, a lot of birthday magic was concocted at this science party. I imagine that “awesome” and “cool” were spoken too many times to count! 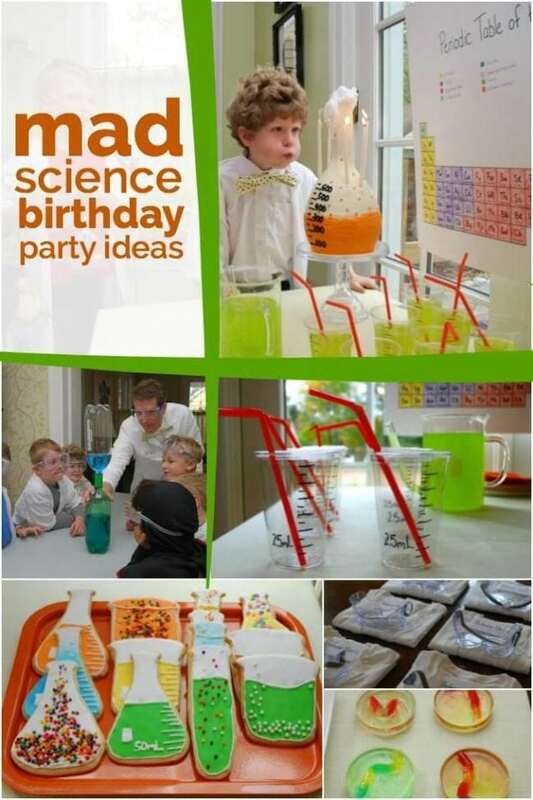 Get ready for a birthday experiment in this boy’s laboratory science birthday party. Results are in, and this science class boy’s birthday party is top notch! Witty invitations are a great way to jump-start a celebration. Anna used pages from a lab notebook and penned party details, which were then inserted into test tubes. Once marked with “open with caution” labels and boxed, the invites were ready to be stamped and sent on their way. Anna even used theme-perfect stamps! When guests arrived, lab safety rules were discussed as lab coats, safety goggles and name tags were dispensed. Would you believe that the lab coats were a DIY item made from men’s undershirts? Anna simply cut straight up the middle of the shirt and had “collars” stitched back for an inexpensive take home favor. One of Anna’s favorite parts of planning her son’s party was styling the refreshment table. To set the scene, she created a “Periodic Table of the Elements of Harris” backdrop poster—a fun science coordinating idea that also allowed the guest of honor to be highlighted. The awesome flask cake was another DIY. What a creative cake idea for a science birthday party. Petri dishes are a science lab staple. I love how Anna used them as a creative way to serve food. These petri dishes weren’t filled with agar, but rather with gummy worms and Jell-O. They looked gross to Mom but the boys thought they were perfect. Anna even got creative with fruit! Cantaloupe balls were arranged on a platter to resemble molecules of water—such a fun detail. Iced sugar cookies were decorated to look like popular science lab equipment—beakers, flasks and test tubes. Take a look at how Anna used sprinkles and edible balls to make them look like bubbling concoctions. A clever DIY, clear cups were transformed into faux beakers with a black marker. The graduated markings really helped them look scientific. In addition to a great refreshment spread, guests got to enjoy a fun day of experimenting. Six lab experiments kept the guys busy. Anna found it helpful to have everything pre-measured and set up before the party. 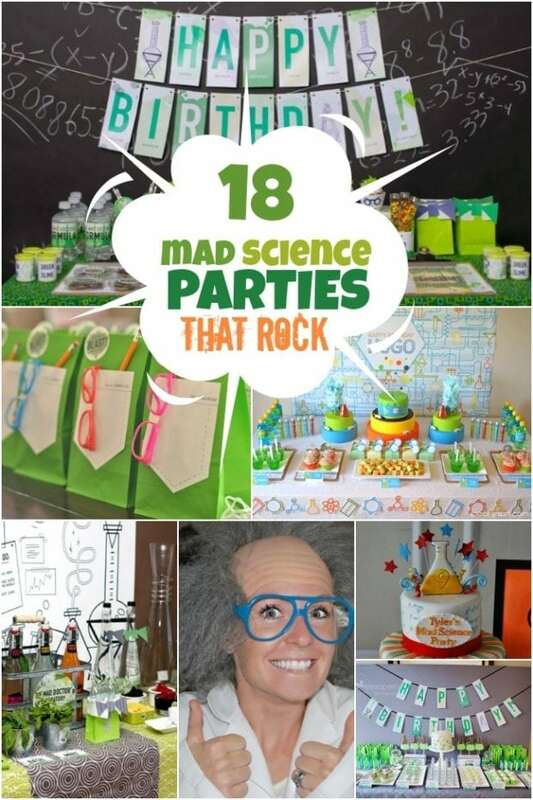 If you have a science lover, a science themed birthday party may just be the right element for celebrating. 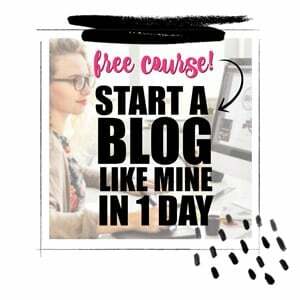 Follow Anna’s ideas and experiment with some of your own. I predict an explosive celebration.